For the September Cinenova Now Showing, artist-filmmaker Kerstin Schroedinger has chosen to show Tracks by Cinenova filmmaker Susan Stein alongside her new film Bläue (Blueness). This will be the first ever showing of Stein’s finished film (made over the course of five years from 1984-9), and the first screening of Bläue (Blueness) after its premiere, where it was exhibited at this year’s Berwick Film & Media Arts Festival. From the exposure of images to sunlight to their development and fixation under running water, we witness the transformation of matter into image. What appears to be a linear and objective guide to the production of a cyanotype—a photographic printing process that produces a blue image—is conflated with images of the pharmaceutical-chemical industry in Switzerland and speculations on historical, social, and material conditions of the same photographic process. Blueness is an experimental video that reflects upon the synthesis of image production processes. The film revisits sites that are related to the history of Prussian Blue, a blue dye stuff, in Seveso, Italy, and Basel, Switzerland. Connections to the pharmaceutical-chemical industry are drawn, which although are latent in the imaging of the blue print, may however only become visible in-between the images and in-between the periods of exposure and development. 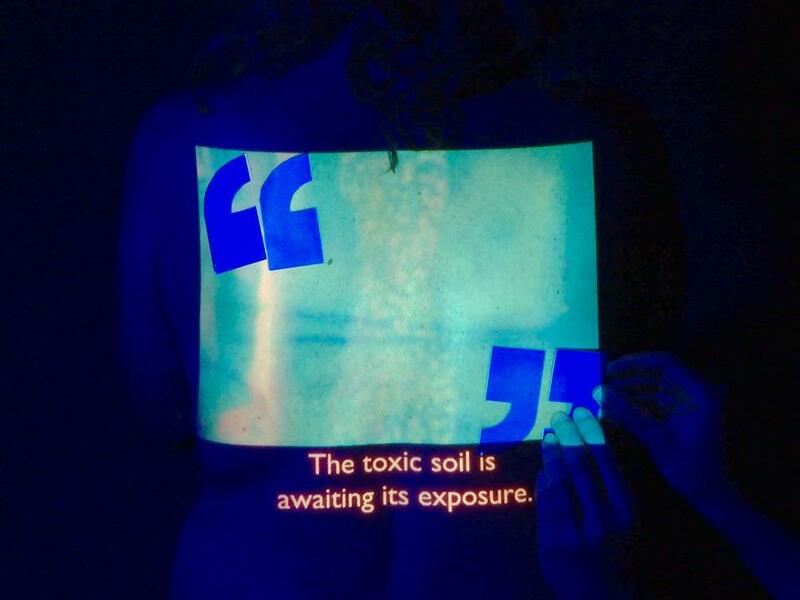 The video creates a network of historical events, chemical-material realisations and medicinal-physical experiences of and through the post-industrial body. But through the process of immaterialisation of labour as well as the production of a re-embodied image space, a figure proceeds through the steps of exposing and developing a cyanotype, performing against chemical substances and a neoliberal take-over of their movements, lingering between the roles of scientist, athlete, pharmacist, patient, woman. Tracks uses the character of a struggling female teacher in order to connect areas of feminism such as the suffragette movement, contraception and abortion rights, motherhood, later feminist writings and poverty, whilst highlighting the contradictions and differences within feminist discourse at the time. It’s a collage film which combines photographic, animated and live-action parts, black and white and colour footage. The voice-over soundtrack is partly a reworking and rewording of individual experiences and also a reflection on perceived actions of women due to historical and contemporary circumstance. It draws on a rich collection of personal and public imagery, re-made and manipulated, layered and textured, while taking a critical look at certain feminist theories. Tracks was five years in the making and this will be its first public screening. Kerstin Schroedinger is an artist working in video, sound and performance. Her historiographic practice questions the means of image production, historical continuities and ideological certainties of representation. Her works and curatorial practice are often collaborative. Recent works include Bläue (Video, 2017), The Alleged Body (performance), shown at Images Festival Toronto, and Les Complices* Zurich in 2017, Fugue (Film, 2015), as well as Rainbow’s Gravity (Video, 2014) and Red, she said (Video, 2011) both with Mareike Bernien. Her work has been shown at the Whitney Museum of American Art, Anthology Film Archives New York, Forum Expanded of Berlinale, Short Film Festival Oberhausen, International Film Festival Toronto, Gasworks London, Arnolfini Bristol, Whitechapel Gallery London, and exhibited at MIT List Visual Arts Center Boston (2016), Photo Cairo #6 (2017), FMAC Mediathèque Geneva (2016), The School of Kyiv – 2nd Kiev Biennale 2015, Kunstpavillion Innsbruck (2017), amongst other places. Susan Stein trained at Saint Martins School of Art and The Royal College of Art. She joined the London Filmmakers Co-operative in 1976 and became workshop organiser in 1979. She was an original member of Circles (which later merged with Cinema of Women to become Cinenova),Between 1984 and 1986, she lectured at the University of Wales in Newport. Since 1987, she has been working as a travelling camerawoman for BBC News. Her short films have been shown in various screenings since 1977. In 2013 she took part in ‘Frontline 2 Fineline’ exhibition at Horsebridge Centre, Whitstable and her film ‘G’ featured in Reel to Real: Women, Feminism and the London Filmmakers’ Co-operative at Tate Modern in 2016. She is currently developing a revisiting and renewing film project in 2017. Cinenova: Now Showing began in March 2015 and runs monthly. The series intends to materialise relationships between contemporary artist moving image practice and the feminist and organising legacies present in the Cinenova collection. Now Showing future invited protagonists include: Kimberley O’Neill, Holly Antrum, Alberta Whittle, Letitia Beatriz, Olivia Plender and more to be announced. Past events have been with Onyeka Igwe, Leah Gilliam, Jamika Ajalon & Ngozi Onwurah; Charlotte Prodger, Tina Keane and Elizabeth Barret, Oreet Ashery, Leone Knight and Jenni Olson; Alex Martinis Roe, Helen Grace and Margot Nash; Ayesha Hameed and Sandra Lahire; Jamie Crewe and Tran, T Kim Trang; Kathryn Elkin and Sarah Turner; Noski Deville and Patrick Staff; Kari Robertson and Judith Barry; Nooshin Farhid and Lis Rhodes; Rehana Zaman and Lai Ngan Walsh & the Law Collective; Lucy Clout, Tracey Moffatt and Susan Stein; Cara Tolmie, Kimberley O’Neill and France-Lise McGurn, Judith Barry and Ruth Novaczek; Justice for Domestic Workers and Leeds Animation Co-op; Claire Hope and Judith Barry; Lucy Parker and Adriana Monti; Kate Davis, Margaret Salmon and Sheffield Film Co-op; Richard John Jones and Karen Everett; Grace Schwindt and Kim Longinotto. With kind support of the Goethe Institute London.